EveryDollar was founded by Dave Ramsey, a talk show host, TV personality, and motivational speaker. He is the author of five New York Times bestsellers, has been inducted into the National Radio Hall of Fame, and has been featured nationally on The Oprah Winfrey Show and 60 Minutes. Like other budgeting tools, EveryDollar is designed to help you better track your income and spending, and set financial goals to help you reach retirement. It also helps you to get out of debt using the Debt Snowball method and incorporates Dave Ramsey’s 7 Baby Steps to debt management and financial freedom. Among budgeting apps, the competition is stiff. Venture-funded companies like Personal Capital offer a free mobile app that helps you to track your daily spending and income as well as your investments. LearnVest, Mint and YNAB each has much to offer too. So what makes EveryDollar different and why should you consider it? Is EveryDollar Different From Other Budgeting Apps? Is EveryDollar Right For You? EveryDollar walks you through a 7-step plan to get out of debt, build wealth, and reach financial freedom. The FinTech company has a unique twist on budgeting that is not applied by most other budgeting apps. It is standard for a budgeting app to link to your bank accounts, gather your financial transactions, synchronize them on a single dashboard to save you the hassle of manual entries, and display your spending patterns, income, and net worth. Where EveryDollar stands apart from its competition is in creating a roadmap that you can follow, called Baby Steps. Baby Step 1: Emergency $1,000 Fund For unexpected life events, such as job loss, faulty car transmission or unexpected pregnancy. Baby Step 2: Pay Off All Debt List your debts (except for your home) and pay off smallest debts first. Baby Step 3: Save 3-6 Months Expenses Build a full emergency fund. Baby Step 4: Save 15% for Retirement Invest 15% of your income in a Roth IRA or tax-advantaged retirement account. Baby Step 5: College Fund For Kids Save for your kids college tuition. Baby Step 6: Pay Off The House Eliminate house payments. Baby Step 7: Build Wealth & Give Leave an inheritance for future generations. EveryDollar is right for you if you subscribe to the debt snowball method which is supported by studies from Northwestern Kellogg School of Management and Harvard. Dave Ramsey and EveryDollar support a method of paying off debt called the Debt Snowball method. The way it works is that you list your debts, and start paying off the smallest balances first while paying the minimum balances on larger debts. After you fully pay off the smallest debt, you move to the next largest debt without regard for the interest rates charged. A contrasting debt reduction method is called the debt avalanche method or debt stacking method, whereby you pay off high interest rate debt first. At the very least, pay the minimum payment on every debt. Calculate how much extra money can be applied to the smallest debt. Pay the minimum amounts plus the extra amount until the smallest debt is paid off. After paying off the smallest debt in full, apply the extra payment to the next smallest debt. The idea behind the debt snowball method is rooted in human psychology. By paying smaller debts off first, you get a winning feeling that you are making progress and receive fewer bills each month. The only debt that generally is excluded from the debt snowball method is a mortgage payment. Whether EveryDollar is right for you depends very much on whether you subscribe to the philosophy of the debt snowball method. The issue with the approach is that you first pay off debt with the lowest balance as opposed to first paying off debt with the highest interest rate. Rationally, it makes more sense to pay off debt that is costing you more each month because otherwise the cost of compounded interest could exceed the gains from paying off debt. In spite of the fact that it makes more rational sense to pay off high interest rate debt first, we humans tend to be irrational and sometimes prefer the feel-good factor of eliminating an extra bill each month more than having a little extra money in our pockets. In fact, a Northwestern Kellogg School of Management study showed in 2012 that “consumers who tackle small balances first are likelier to eliminate their overall debt” and a 2016 Harvard study concluded the same thing. The premium service of EveryDollar costs $99 per year, but you can try it free for 15 days. When you sign up to EveryDollar, you receive a free trial for 15-days but thereafter you will be required to pay an annual charge of $99 for the premium service, EveryDollar Plus. 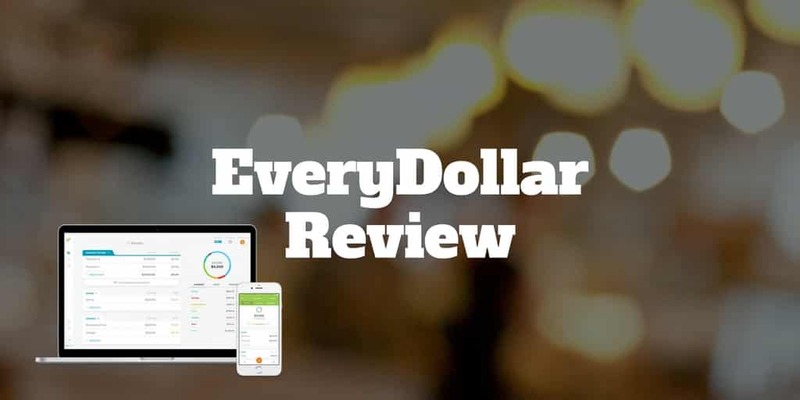 EveryDollar provides users a clear roadmap to reducing debt and helps connect users to local experts who can help save money on insurance and tax services, and comes with an annual price tag that rivals a Netflix subscription. ✅ Roadmap to Paying Off Debt: The Baby Steps method of debt reduction helps you to achieve easy wins and build up to bigger wins to ultimately become debt-free. ❌ Pricing: Compared to some budgeting apps like Personal Capital and Mint that are free, EveryDollar does have a paid subscription. ✅ Connect To Local Experts: EveryDollar connects you to local financial experts to assist you with term-life insurance, tax services, auto and home insurance, retirement investing and home buying & selling. ❌ Manual Tracking: The free version supports manual tracking only. For a fully synchronized version, you will need to pay for the premium service, EveryDollar Plus. ✅ Research-backed Debt Reduction Method: Studies from Kellogg and Harvard show that paying off low balances first as advocated by EveryDollar lead to a higher likelihood of paying off debt in full. ❌ No Investment Tracking: EveryDollar targets budgeting alone but does not track investment accounts. ✅ Mobile Compatible: An iPhone app is available to users. ✅ Risk-Free Trial: Before risking a dime, you can use the software at no cost for 15 days to see if you like it. ✅ No Ads: Unlike Mint, which serves ads to users, EveryDollar does not serve you with advertising offers. EveryDollar is a budgeting tool by Dave Ramsey, syndicated radio talk show host and author of numerous New York Times bestselling books. The budgeting software is designed to help you pay off debt by providing you a clear roadmap of Baby Steps as part of a process called the debt snowball method. You learn how to build small nest-eggs, pay off small debt balances first, and gradually grow your savings while continually reducing debt until you are financially free. The method advocated may apply to most individuals but if you are hyper-rational than you will find it difficult to adopt a method that tackles the smallest debts each month first before targeting debt accounts that have the highest interest rates. Have you used EveryDollar? Share with us your experiences in the comments section below.